Linda Sanchez, a 24 year old native from Oaxaca Mexico, recently graduated from UC Berkeley obtaining a dual degree in Political Science and Chicano Studies. Her passion to create an inclusive and equitable society stems from her personal experience with discrimination, poverty, and violence. The feeling of being "othered" is what informs her work as she strives to support and sustain a strong community that work towards the liberation of disenfranchised women. She is an animal lover and advocate, environmentalist, youth organizer, and entrepreneur. On her limited time she trains for marathons and works making pastries at Berkeley's Casa de Chocolates. 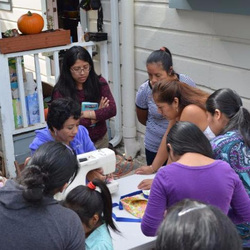 Linda's project addresses unemployment among immigrants by forming a cooperative of indigenous Mam (Guatemalan) women who will create and sell ethically-made and indigenous-influenced apparel.